President frowns at "law enforcers' wars"
"Hullabaloo, screams and feathers remind of a Latin American carnival." "Society would rather a war against corruption and other forms of crime than a war of compromising materials. I as president am with the society. Both the president and society welcomes healthy, civilized, and fair competition. Meanwhile, conflicts, quarrels, intrigues and hatred are unacceptable as they play into the hand of a common enemy - crime and corruption," he said. 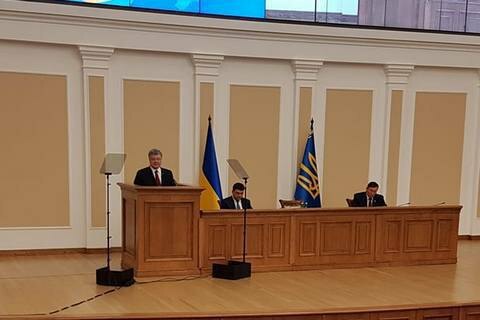 Poroshenko underscored that competition is the engine of progress but it must be healthy. "The amounts of hullabaloo, screams and feathers at times resemble a Latin American carnival... It would've seemed funny if it were not so sad," he said. Ukrainian law enforcement and anti-corruption agencies have been recently involved in a series of public interagency conflicts. National Anti-Corruption Bureau is at loggerheads with the National Agency for the Prevention of Corruption, Interior is in public conflict with NABU, Prosecutor-General's Office opened a case against the director of NABU, the latter is probing the prosecutor-general, the SBU detained a NABU undercover agent. In addition, there were tensions between NABU and the Specialized Anti-corruption Prosecutor's Office.